Why did the assassin not display any of those symptoms? Was she wearing gloves or was the agent contained in a capsule? (And if she was wearing gloves, were they then not found? Or fragments of a capsule?) Did she receive a nerve agent pretreatment antidote? There were some reports of vomiting, but was this reaction related to nerve agent exposure? Any splash of a tiny droplet anywhere on her body would have resulted in some symptoms of varying degree. She was jailed, but nothing to such effect was reported. 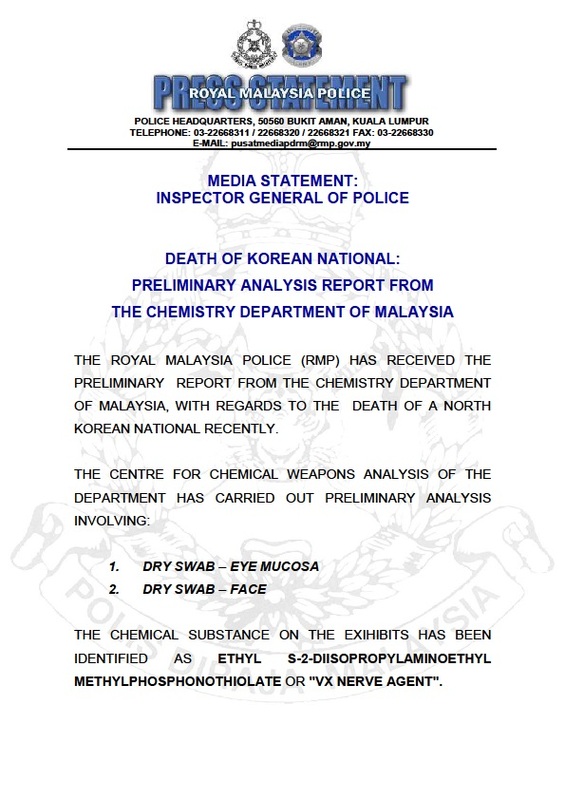 This entry was posted in Chemical and tagged Assassination, DPRK, Malaysia, Nerve agent, Terrorism, VX on 24 February 2017 by JP Zanders.